RIO DE JANEIRO (Reuters) - Brazilian President Dilma Rousseff has one last chance to stem a growing political and economic crisis before being forced to step down, one of the country's leading daily newspapers said on Sunday. In an unusual front-page editorial, Folha de S.Paulo said Rousseff needs to take "drastic measures" including additional spending cuts and tax hikes to make up for a 2016 budget gap that has cost Brazil its investment-grade rating from Standard & Poor's. Rousseff, a leftist who was re-elected by a thin margin in 2014, is facing impeachment calls as her government struggles with a deep economic recession and a massive corruption scandal at state-run oil company Petrobras that has implicated several of her political allies. In a cabinet meeting on Saturday, Rousseff ordered her ministers to find an additional 15 billion reais ($3.9 billion) in budget savings, daily Estado de S.Paulo reported on Sunday. Folha, which tends to lean center-right, said deep budget cuts are needed for the government to gain credibility before demanding more tax hikes that will face strong popular opposition. "The country, however, has no choice" but to accept higher taxes, Folha said. 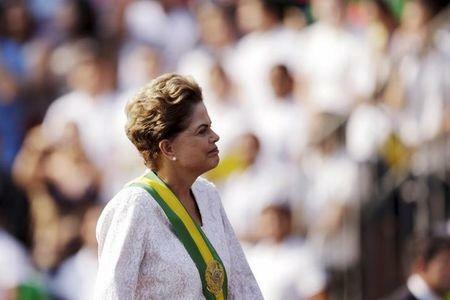 "Neither has President Dilma Rousseff: if she bends under the weight of the crisis, she will have no option other than leaving her presidential duties and, eventually, the position she holds." Folha also called for an end to some pension benefits and economic subsidies, as well as temporary cuts in health and education programs that are currently mandatory. A spokeswoman for Rousseff declined to comment on the editorial.